W and I are proud to announce that we are almost homeowners! Everything will be official soon, but until then I should probably explain how we have arrived at this point. During the month of June, I traveled home to Texas for a family beach trip and some time in my hometown. The first week of my trip was on Mustang Island, which is outside of Corpus Christi, and is home to a small town named Port Aransas. Our week at the beach consisted of rest, relaxation, amazing food, and a surprise baby shower for my sister Elizabeth (I’m going to be an aunt!). I assured W that surely it could wait a few days – he just needed to cool his jets. However, let me say that two weekends prior every.single.house we had an interest in went under contract. The Homewood area is still so desirable that its real estate market is fast-paced. Great homes move quickly. After showing my entire family the listing photos and virtual tour at the beach, everyone took W’s side and agreed that this house will not last through the weekend. W and I agree that he can put an offer on a house I haven’t even seen as long as it is contingent on the inspection. My family beach trip wraps up and we head to my hometown so I can have more time with sisters and my parents. During these few days, W keeps me updated on negotiations and schedules the inspection for the day after I fly back to Birmingham. After flight delays and a piece of luggage lost, I arrive home at midnight and I’m due to be at the house bright and early the next morning. Inspection day is super hot. I arrive at the house with my own camera, iPhone, notepad, pen and a 25 ft tape measure. I was so nervous because what if I absolutely hated it?! Who lets their husband buy a house?! I was also excited because I thought it had potential from the photos and virtual tour. 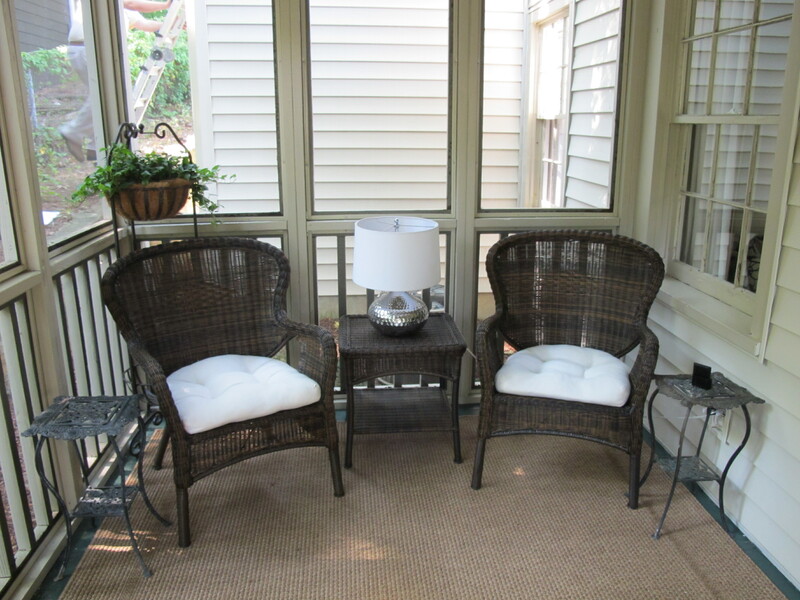 You enter this cute Homewood cottage through a screen door that leads to a screened porch. Not a bad start. 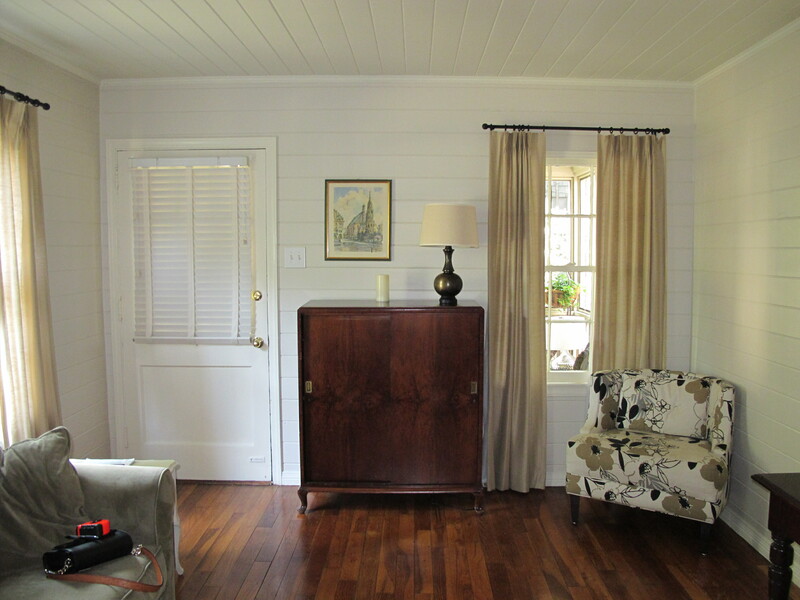 I take measurements of the room and hope that I like everything else as much as the porch. Once I recorded my measurements, I entered into the living room. Can you even believe the hardwood floors? Again I was really happy with what I had seen so far! I walked through every room, one-by-one, taking measurements and recording them for my future reference. Heck if this was the house I was going to have a lot of planning to do! Needless to say every room had its perks and I understood why W had to act without me. 🙂 The inspector was very thorough and helpful. He gave us a few things to consider/negotiate and we decided that we would negotiate since we loved the house. I should explain at this point that I have a history working in real estate and I am licensed in Georgia. Our thoughts at this point were: Should we negotiate on the sale price? Negotiate on closing costs? Or negotiate that the sellers’ must fix it or we walk? The answer to that question depends on your personal situation. We decided that if the sellers’ could cover closing costs, then we could use our funds to make the appropriate repairs. After more successful negotiations, we were under contract! Since that day I have been making big plans for every room on Pinterest. You can follow me here or follow our house board here. Once the closing is complete, I will show everyone the facade. I can’t wait!